If you have been on the fence about having a facelift or maybe aren't a candidate for medical reasons, you might be interested in a new, non-invasive modality for lifting and tightening skin on and around the face. Now being offered at the practice's Aesthetic Suite, Ultherapy is the only non-invasive procedure FDA-approved to lift skin on the neck, under the chin and on the eyebrow, and to improve the appearance of lines and wrinkles on the décolletage (chest). After testing it out for many months, we want to show you the impressive results and how Ultherapy can help to achieve a fresher, more youthful look from your brow to your chest. Patients of Drs. Feingold, Israeli, Korn, Light and Bank are invited to a special Ultherapy event, hosted by our aesthetician Annette Pennington, on Thursday, December 1 at 4:30pm at the NYBRA/Aesthetic Plastic Surgery, PC offices. Join us for refreshments, hors d'oeuvres and a demonstration from the Ulthera representative. Interested friends and family are welcome to join, and attendees who schedule a treatment after consultation will receive a special event discount on their Ultherapy treatment. Space is limited, so RSVP soon by emailing Annette (click here or copy link for email). This state-of-the-art non-invasive procedure harnesses the power of ultrasound, which has been used safely throughout the medical field for more than 50 years, to lift and tighten the skin naturally, without surgery or downtime. Ultherapy has been established as safe and effective in clinical studies and in over half a million treatments worldwide. 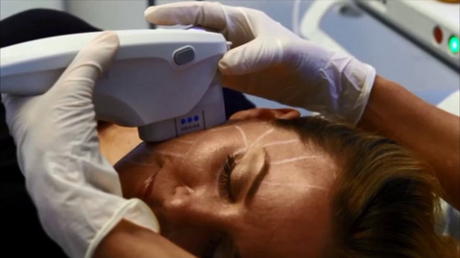 The procedure stimulates collagen production by delivering focused ultrasound energy to the skin’s foundational layer typically addressed in cosmetic surgery—without cutting or disrupting the surface of the skin. Most people only need one treatment to achieve noticeable results. Some patients see an initial effect right after their treatment, but the real results appear over 2−3 months as new collagen works to lift and tighten skin on the neck, chin and brow as well as smooth skin on the chest. While Ultherapy won’t duplicate the results of a facelift, it is a clinically proven non-invasive alternative—and can even be an option for patients who wish to extend the effects of cosmetic surgery. Hope to see you on Thursday, December 1.